Two teams that are coming off their bye week but are going in seemingly opposite directions collide in Boulder on Friday as the 3-0 Colorado hosts the 0-3 UCLA. 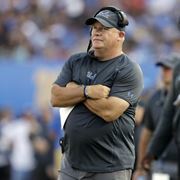 Although Chip Kelly was hired in the offseason to improve the Bruins offense UCLA is still looking for its first win of the season and struggling offensively, scoring about 17 points per game. Although the offense is not getting it done for the Bruins, they haven’t been nearly as half as bad as their defense which has allowed an average of about 37 point per game. That is troubling considering that Colorado has been on fire so far this season as they are scoring about 41 points per game in 2018 and are looking forward to exploiting the Bruins’ struggling defense. Kelly’s tenure started to disappointing results as he never lost more than three games in an entire season as head coach of the Oregon Ducks and only lost seven games in four years. Although the Bruins have played some teams with very good offenses there is no excuse for their 0-3 record. Yes, the Bruins defense has played terribly, but most of the time they should not lose to teams like Fresno State and Cincinnati at the Rose Bowl. Losing to Oklahoma on the road is understandable but being blown out by Fresno State at home is not, and it just reflects how bad their defense is this season. In that game they allowed Fresno to take it to them on the second half and run away with it en route to a 38-14 loss. This game may not be as one-sided as the record of these two teams indicates. There is a lot of history and some bad blood between these two teams and you can expect UCLA to put somewhat of a challenge as Chip Kelly wants to avoid losing four games in a season for the first time in his career less than a month after his debut. UCLA’s defense might have had time to improve a little during the bye week, but we don’t think they magically solved all their issues in a span of two weeks. Prediction: With his game being on the road and Colorado’s offense being on fire we expect the Buffalos to win this game 34-26 as they scorch UCLA’s troubled defense.